Eyeglass chain, reading glasses chain, sunglasses chain, extra loop ends. RazzleBedazzle makes beautiful work-of-art eyeglass chains that last. On any eyeglass chain, the loops that hold your glasses will eventually stretch and loosen. If an eyeglass chain can no longer hold your glasses securely, it becomes useless. That is why RazzleBedazzle makes every eyeglass chain with a lobster claw fastener at each end. If the loops stretch, you can quickly and easily remove them and snap on a new pair. Every RazzleBedazzle eyeglass chain comes with TWO FREE EXTRA pairs of loops in two different styles! RazzleBedazzle eyeglass chains are strung on super strong and flexible nylon-coated 49-strand steel cable. Each chain is approximately 28" to 29" long, is packaged in a velveteen drawstring pouch, and would make a wonderful gift. The Dragonfly Eyeglass Chain includes some of my favorite colors - teal, purple, lavender, aqua, and gold. Each chain has eleven large faceted amethyst gemstones. These 8mm high-quality gems are a luscious grape purple color, and they really sparkle! They are surrounded by Czech and Japanese glass beads in many different shapes and sizes. 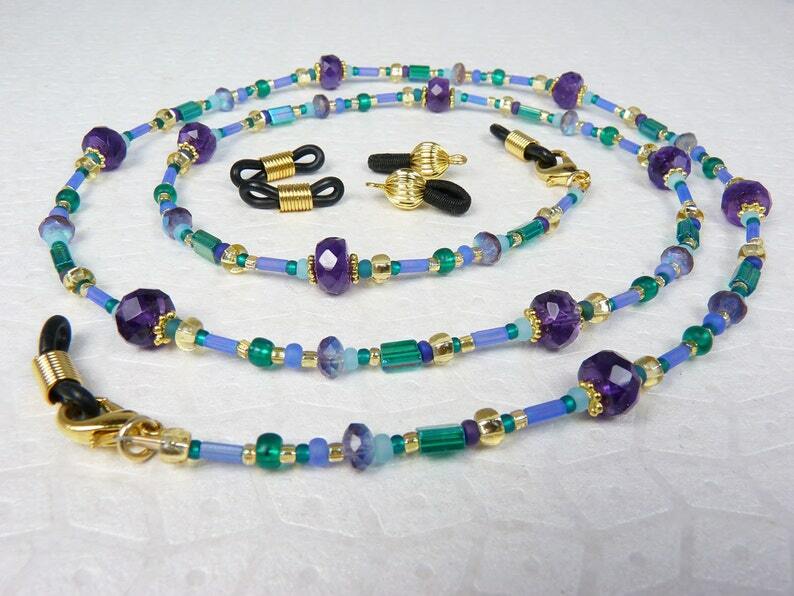 The colors of the glass beads include teal, aqua, lavender, purple, and gold. There is a combination of matte and shiny beads. Some of the beads have an iridescent coating like the shimmer of dragonfly wings. This eyeglass chain would be perfect for eyeglass frames that are gold or any shade of purple, lavender, or teal. BONUS FEATURE! To convert any RazzleBedazzle eyeglass chain to a necklace, simply snap off one eyeglass loop and then attach that lobster claw to the other side of the remaining loop. Check out all of RazzleBedazzle's eyeglass chain designs! 2days. Moreover, there was a gift with the oder. A very cute little purse, which I will you use to store my jewelry. Thanks a lot RazzleBedazzle (Jan).